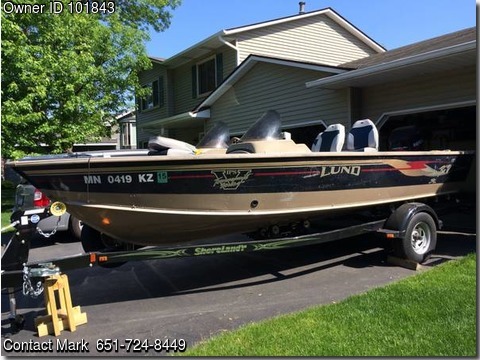 Boat is located in Eagan,Minnesota..Please contact the owner @ 651-724-8449...1996 Lund 1900 Pro V SE 1996 Mercury 175 efi (two-stroke). Stainless steel prop. 2014 (Yes! New in 2014!) Shorland'r roller Trailer (Bought the trailer in fall of 2014. Less than 1,000 miles on it). Spare Tire 5 newer pedestal seats Bow mounted trolling motor On-board charging system. 2 Lowrance depth finders (no GPS). One up front by trolling motor.